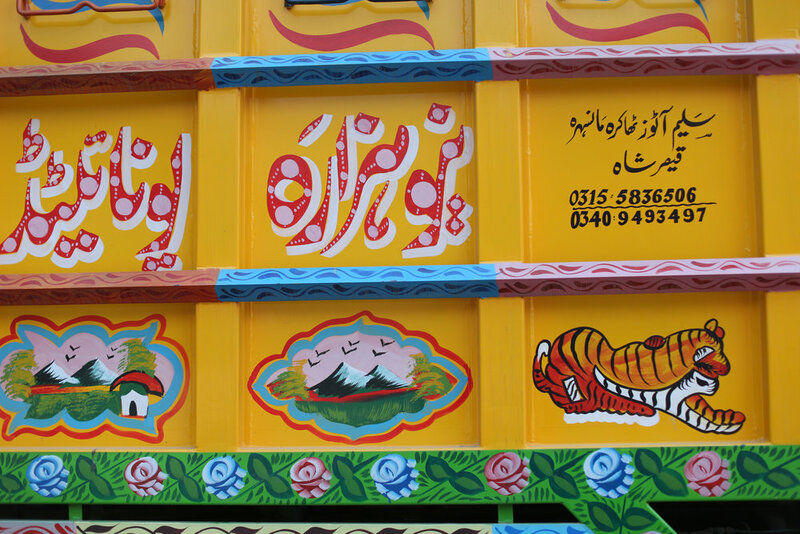 Toronto - Kotka - St.Petersburg - Nizhniy Novgorod - Samara - Beyneu - Bukhara - Samarkand - Dushanbe - Khorog - Ishkashem - Murghab - Sary Tash - Kashgar - Sost - Gilgit - Islamabad - Lahore - Amritsar - New Delhi. After our trip to Mongolia in 2013, we realized that we needed a better vehicle for such a long distance drive. 10 months later I was holding the Nova Scotia license plate of our 1995 Toyota Land Cruiser, shipped to Canada directly from Japan. Fortunately, the customs fees for importing this car to Canada was very reasonable. The customs fees for importing it to Russia from Japan would have been prohibitive. It was cheaper to register it in Canada and then ship it to St.Petersburg. Now that we had a proper car we started looking for the best route. In 2014, after our second overland trip to Kyrgyzstan, the idea of driving to India, following the ancient silk road routes, had taken hold of us. Why Land Cruiser 80? Why from Japan? I am a strong believer that cars manufactured in Japan are way more reliable and durable, especially the ones manufactured before 2000. This car is the third car we buy from Japan. If you are on a budget, Toyota Land Cruiser 80 is one of your best options for overland expeditions like this one. Last but not least, this car is well known in Central Asia which makes it easier to find mechanics and parts to fix it in the middle of nowhere. We had to cross 7 countries: Russia, Kazakhstan, Uzbekistan, Tajikistan, Kyrgyzstan, China, Pakistan and India. It took us six months to get all the visas, order the international carnet and sign a contract with a tourist agency in China. It was not as hard as we expected. We found that it was better to apply for an Indian visa before applying for Pakistani one. There is a big stigma about driving in Russia. Partially due to the viral dashcam videos with the insane footage. In reality, foreigners are just fine on Russian roads. Before judging I would recommend driving in some other countries where dash cams are not so popular: Columbia, Pakistan or India. As usual, we avoided Moscow traffic and headed south towards the Kazakhstani border. Being on a low budget we preferred to camp whenever it made sense. It’s always a fun game: after driving the whole day. After dark, you try to find a good place from satellite images, navigate the driver, adjust to the real situation (fences, farm fields, road closure, prohibition signs), and decide fast. You finally realize where you ended up only the next morning. The day of our departure at 3 AM. We already had a small electrical problem. Tu-144. Russian supersonic airliner. Conducted 55 service flights with passengers in 1977. Imperatorsky Bridge. On 5 June 1983, a cruise ship Aleksandr Suvorov crashed into a girder of this bridge. The catastrophe led to 177 deaths. After crossing the border we headed south towards the Caspian Sea. Unfortunately, in Atyrau, we could not get to a beach. It’s either too far or you need a special permit. There is no diesel in Uzbekistan. Don’t even waste your time trying to buy it at a gas station. If we did not have our jerry cans we would have been in big trouble. In circumstances like this, just talking to people usually helps. “The Great Game” is a term referring to the antagonism that existed for most of the nineteenth century between the British Empire and the Russian Empire over all these territories in central Asia. One of the most important events of The Great Game happened here, in Bukhara. The Khanate of Bukhara was a powerful state in Central Asia from the 16th to late 18th century. In 1838, Colonel Charles Stoddart, a British officer, arrived in Bukhara. He was there to arrange an alliance between Nasrullah Khan and the British East India Company for the purposes of countering the rising influence of the Russian Empire. He was not lucky. Nasrullah Khan put him into the "Bug Pit" - a vermin-infested dungeon under the Ark Fortress. He had spent 3 years there before another British officer, Arthur Conolly, the inventor of the term The Great Game, attempted to rescue him. He too was immediately thrown into prison. Within 6 months both of the young officers were beheaded in front of the Ark Fortress. The Ark of Bukhara where both men were executed on charges of spying for the British Empire on 24 June 1842. Over the next fifty years, Russia subdued the areas that are now Kazakhstan, Turkmenistan, Uzbekistan, Kyrgyzstan, and Tajikistan. Central Asia would remain under Russian control until the fall of the Soviet Union in 1991. We managed to get out of the center of Registan (the heart of the ancient city of Samarkand) after we recorded this footage with our drone. Local security had already noticed us. Sherdor Madrasah (on the video below) was built in 1630. The image of living beings in Islam is not accepted, so this mosaic is unique in its kind and is one of the business cards of Uzbekistan. A spacious courtyard paved with cobblestone from Chupanatinsky slate. It's hard and very time consuming to properly search a car. Picture this: you are arriving on a border somewhere deep in Asia, in a dirty car with a Canadien license plate. Your belongings are all over the vehicle, dirty roof bags are on top, everyone on the team is tired and exhausted and you are dreaming of finally finding a shower. To a border officer, you don't look like a smuggler worth his time. Usually, they are not alarmed and barely check inside. If these crazy people made it so far, what are the chances? But, who knows? The last thing you want to hear is that they want to search through every inch of your car. 'What are you talking about, officer?' - I tried to play the fool but it did not help. Fortunately, the situation did not end up with a car search, but they did bring in a dog to check these weird Canadiens out. We finally reached the mountains, ready for our next leg on the Pamir highway. This is an ancient silk road route. 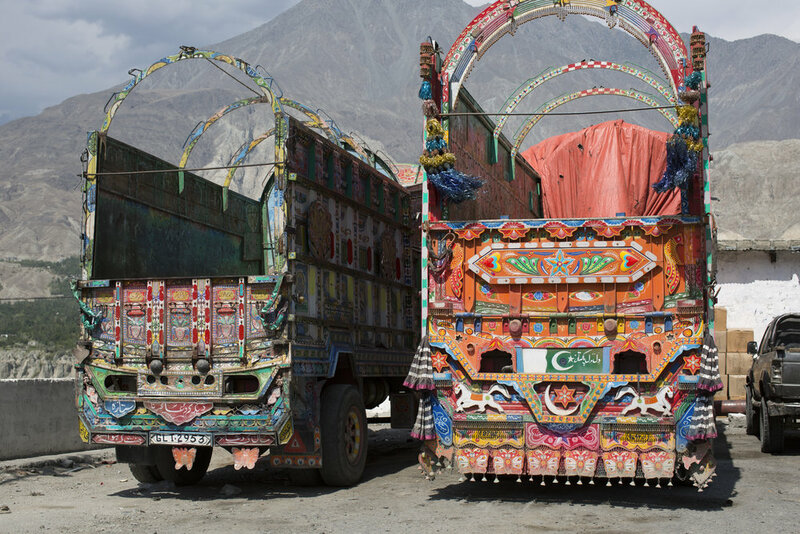 We are going to drive along the Afghanistan border. It's also called the Heroin highway. On an average day, 300kg of heroin is smuggled on this route. This is the land of the Pamiris - an Iranian ethnic group who are native to the Gorno-Badakhshan Autonomous Region of eastern Tajikistan. The Pamiris share close linguistic, cultural, and religious ties with the people of both Badakhshan Province, Afghanistan, and Taxkorgan Tajik, an autonomous county in Xinjiang Province, China. The borders of these countries, like many in Central Asia, were drawn by foreign powers often without any respect for ancient and established ethnic communities. The religion of the Pamiris is Ismailism - a branch of Shia Islam, which has an estimated 10-15 million adherents. This is the only community on Earth with a living Imam who holds the title of Aga Khan: Prince Shah Karim Al Husseini Aga Khan IV (born in 1936). Aga Khan is one of the world's ten richest royals with an estimated net worth of US$800 million. He is a business magnate with British citizenship. He is unique among the royal elite as he does not rule over a geographic territory. Among his goals is the elimination of global poverty, the promotion and implementation of secular pluralism, the advancement of the status of women and the honoring of Islamic art and architecture. He is a very respected person among the Pamiris. He helped to rebuild the region after the devastating civil war in Tajikistan. Driving along the Afghanistan border we follow the Pyanj river. We can see villages across the river, people working in the field, construction workers building a tiny road along the opposite bank. Suddenly an explosion on the Afghanistan side throws small stones across the river in front of our car. We stop in a horror. What was it? A drone attack? A Taliban group crossing the border? After the dust is settled we are realizing that it's just road construction. They secured their explosion site but did not think much about cars across the river in another country. You need to get a special permit in order to drive on Pamir highway. You can easily get one in Dushanbe in person. No need to pay extra and to order them in advance from an agency. If you want to go to Zorkul lake you will need another permit. You can get it in Khorog in a tourist center. Aga Khan in a local house converted to a museum. 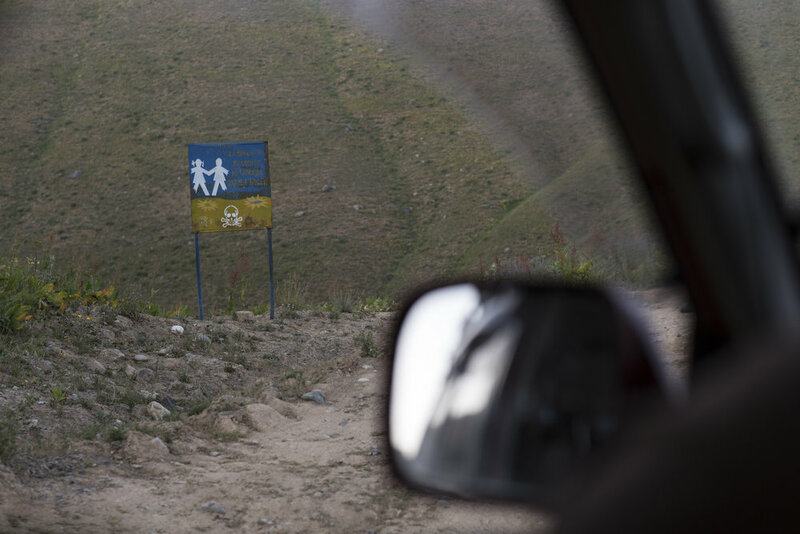 Minefields cover thousands of square kilometers of Tajikistan's territory since the country's 1992-97 civil war when the mines were laid by both government forces and fighters from the United Opposition movement. The only security measure they have now are these scary warning signs. But it worked: we did not even consider walking behind the signs even though it was a perfect camping spot. Sometimes we camped literally a few dozen meters from Afghanistan. 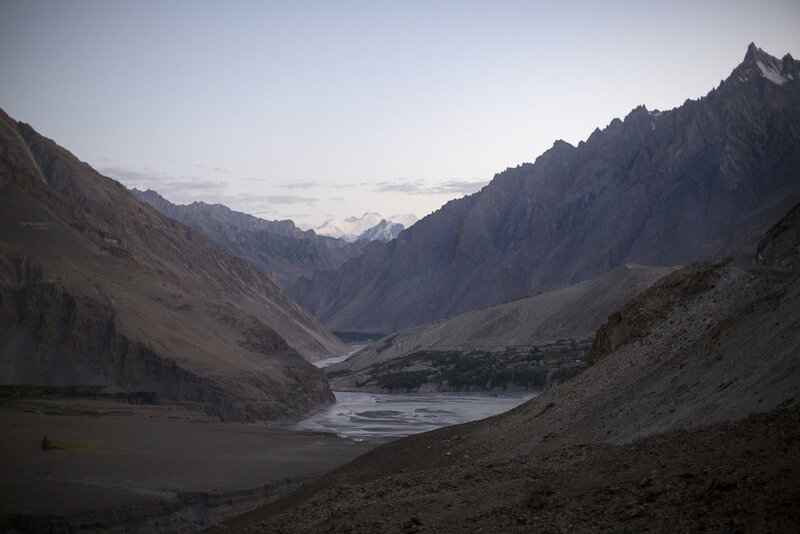 Then we traveled along the Wakhan Corridor - a narrow strip Afghanistan territory (350 km long, 13-65 km wide). This is one of the strangest political borders on the planet. The corridor was created in 19th century as a buffer zone between the Russian Empire and British Empire. These enemies did not want to face each other. Both empires are gone now, but the buffer zone is still working well. There is no way we can cross the corridor. Sometimes we are about 30 km from the territory in Pakistan. The altitude is more than 4000 meters. Some passes are as high as 4500. We all suffer from altitude sickness; headaches, fatigue, rapid pulse, shortness of breath and tingling in our fingertips. We can not afford to slowly and safely gain altitude due to our rigorous schedule. You end up waking in the middle of the night because of lack of oxygen in your system. We take Acetazolamide and painkillers. After 4 days we feel better. Next time I will definitely schedule at least one-week of acclimatization for these altitudes. Finding a place to stay is not a problem for tourists in Tajikistan. You can either camp out or stay at guesthouses. Hotels are also available. We often stayed with locals in their homes. 25km in diameter, this lake was formed by the impact of a meteor 25 million years ago. It’s probably the highest lake on the planet of this size. Its previous name is Lake Victoria, named by British military cartographers. We find this name on all maps before 1920. Soviet cartographers replaced it with Karakul or Black Lake in the Kyrgyz language. As usual, we used satellite images to try and spot a camping location. We drove to the south shore trying to pass between a lake and a swamp. The wind was rising and we put our tent behind the stone walls of old ruins. This is a border pass between Tajikistan and Kyrgyzstan. This pass is practically impassable if it rains. The unpaved mountain snakes along on the Kyrgyzstani side and is very steep and slippery. This thunderstorm (on the video above) started just minutes after we came down from the pass. Stop. Or we will shoot. We have a short 500km leg in Kyrgyzstan. This is the only way for us to get to the city of Kashgar in China. You can not fly your drone in Xinjiang province and we decide to leave the drone in Kyrgyzstan with our friend Ekaterina Borisova. She runs a tourism business in Kyrgyzstan (Evergreen Adventure). She is an expert in Kyrgyzstan/Tajikistan area and can help with trip planning, logistic, accommodations, car tours booking, anything. She also has a guest house in Karakol. Thank you Katya! Her contacts: everegreenkyrgyzstan@gmail.com, +996551021318, instagram: katusha_evergreen. We enter one of the poorest provinces of China and the border crossing is painful. This is the first time we experience communication problems. People here speak neither English nor Russian. We must be always accompanied by a guide. They check all of our belongings, x-ray the car, scan all the computers and cell phones. Xinjiang is a Muslim minority province. The government claims that they are fighting extremism here but the reality is a scary sci-fi dystopia where an uncontrolled government abuses new technologies. Hundreds of thousands of people (nobody really knows how many) have been put in so-called 're-educational camps' without ever being charged. Street cams with face recognition are literally everywhere. The omnipresence of police makes you feel as if you are in a war zone. Police stop people on streets and check their cell phones for the mandatory pre-installed government app which tracks all of your movements. Artificial intelligence calculates your social score and if it's low you are in trouble and might be sent to a camp. If you just talk on the streets with someone who is not considered loyal, you might be in trouble. Locals (Uygurs) cannot even leave the city. It is even more difficult is to obtain permits to leave the province or country. Kashgar is a beautiful modern city. The streets are full of scooters, all of them electric. It took us several days to finish their maze of paperwork. We will spend only 5 days in China, but need a local license plate, a local driver’s license and dozens of permits. Finally, we are on the Karakoram highway. China invests a lot into rebuilding all the ancient trading routes and opening them up again. The road is one lane but it is perfect. The limit is 60 km/h and this is great as it gives you time to enjoy the imposing 7K Himalayan peaks. Kashgar. The entrance to the Old City. A women is dancing behind the police block post. Pakistan comes as a relief. No police, no crazy checkpoints, everybody speaks English. We are in Hunza valley and it takes some time to adjust to driving on the left-hand side of the road. Chinese military units built this road. It's still fairly new but already needs some maintenance. Surprisingly, we did not find a working ATM and had some problems searching for a place to exchange US dollars. Only 2 years ago this road was blocked by flooding. Drivers had to use small boats to move the cars across a huge lake. Today we enjoy a perfect road with brand new bridges and tunnels. Just before Chilas we turn left to N15. At the first military checkpoint, a soldier with AK47 gets into our car. On the second military checkpoint, they provide a separate car with four soldiers and a machine gun. That car follows us down a beautiful serpentine road to Babusar pass. It’s getting dark and we want to be at the summit before the sunset. After a couple of kilometers, we don’t see the military car anymore. These were the scariest moments of our trip, not knowing what their intentions where. They probably decided not to waste gas on us. Winding roads climb ever more tightly but our Land Cruiser scales these torturous roads with power to spare. We are heading to Islamabad and after hitting intense night traffic on the narrow streets of several small cities we finally encounter a surprising sight for the first time since we left Russia: a 6 lane highway in perfect condition. The strange thing in Islamabad is that there are no women on the streets. Finally, we are able to fix our air conditioner here. 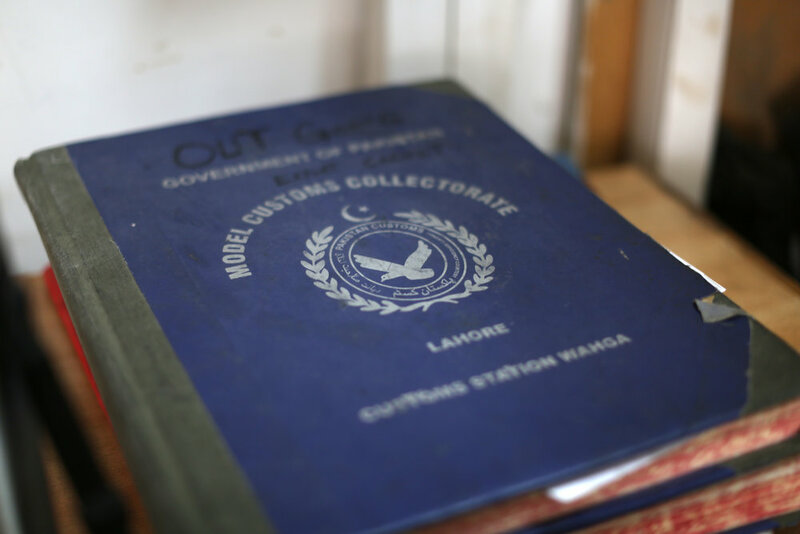 “He sat, in defiance of municipal orders, astride the gun Zam Zammah on her brick platform opposite the old Ajaib-Gher—the Wonder House, as the natives call the Lahore Museum. Who hold Zam-Zammah, that 'fire-breathing dragon', hold the Punjab, for the great green-bronze piece is always first of the conqueror's loot.” Rudyard Kipling, from the famous novel Kim. I read this great book in Russian translation when I was a teenager. From this book, I learned about The Great Game. This is the last, and 7th border of our trip. The Wagah-Attari border is unique. It is closed to locals and we did not see another tourist car here. We passed the gate just an hour before the beginning of the famous lowering of flags ceremony. The confrontation between India and Pakistan gave birth to this ‘show’ on the border. Every day, thousands of people gather to enjoy how security forces on both sides try to outdo each other in what seems like a dance competition, consisting of rapid choreographed maneuvers and raising their legs as high as possible in a sort of military can-can. Behind this seeming fun, is the undertone of two nuclear powers staring each other in the face. In order to cross these borders by car, you need a Carnet(an international customs and temporary export-import document). On top of this, the time your car is allowed to be inside the country is also limited. In India, you can only get a 6-month permit on the border. The problem is that we plan to store the car in India for 12 months until our next vacation. The idea is to drive to Tibet next year. We only have 4 days to apply for a Carnet extension in Amritsar. If we don’t get it, it will entail huge additional expenses we can ill afford. Our application is well prepared: it contains all the dates, numbers, and all the reasons why we are good guys and should be granted this 12 months extension. We are stressed and prepared for the worst case scenario. In fact, we don’t even have a plan B. If the car has to leave India in 6 months we can not even drive it back during winter as the mountain passes will be closed. To our surprise, everything worked very smoothly. The officers were very nice and helpful. Dear officers from Amritsar Customs Commissionerate, thank you once again should you ever happen to read this post. 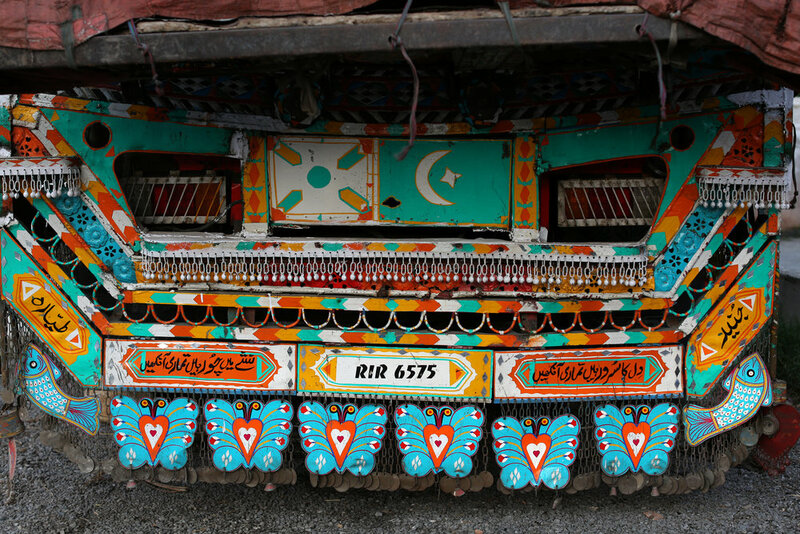 Driving in Pakistan and India is a hell of an experience for us. This is not our first overland trip but it takes time to adjust. The main problem is not driving on the left. That’s a minor issue. The main difference is the perpetual use of the horn to signal your intentions, and it has nothing to do with expressing annoyance or anger. Consequently, people don’t check their blind spots and don’t even look in the rearview mirrors. It might sound crazy for a western driver, but it is just a different system: you are responsible for what is in front of you, not behind. Like on a downhill ski slope. When I finally stopped checking my blind spots I suddenly realized how much energy it takes to keep track of all the objects behind you. We decide to drive through the night to arrive early in the morning rather than hit the daytime traffic of New Delhi. At 4 AM we arrive at our friend's house. Next day I drive to a car service and realize how much time we saved. Driving our truck on the busy streets of Delhi is stressful, to say the least. Our car is waiting for us in Delhi. Next year we are going to explore some remote areas in Tibet. If you want to know more details, or if you planning to drive a similar route, don’t hesitate to contact us. We are happy to share what information we can.